Running Press Kids, 9780762456819, 256pp. Kate Marino knows very well that home is where her heart is, and if she had any say in the matter, her heart would stay put in Big Red. The old, rambling farmhouse has withstood the test of time with her family, but now Kate's parents have decided to sell it from under her feet. The preventative solution: sabotage the realtor's tours with the help of best friends and a plan that has maximum stinkage potential. The back-up plan: hang on to at least a little bit of life at Big Red by creating shoebox dioramas of each room. But even with a full-scale assault, will her mission be a success? And if not, what will the diorama of Kate's future look like? With a keen eye for capturing the moments that matter, acclaimed author Tara Altebrando explores the pain-and promise-of letting go. 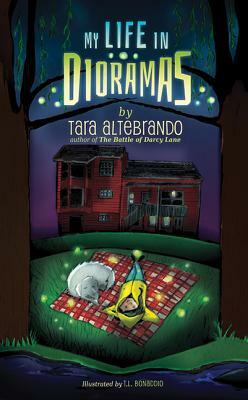 Tara Altebrando is the author of several novels, including The Battle of Darcy Lane, The Best Night of Your (Pathetic) Life and Dreamland Social Club (a Kirkus Reviews Best Book for Teens of 2011). She is also the co-author of Roomies with Sara Zarr. Tara is a Harvard grad living in Astoria, New York, with her husband and two daughters. "Humor will reel readers in, but heart will keep them riveted." "Charming, touching, and laugh-out-loud funny."